Plaque Removal a sticky substance made from leftover food particles and saliva that mix in your mouth. If you don’t brush properly after meals, it begins to form and build up on your teeth. This is problematic because plaque contains bacteria, which can contribute to tooth decay and gum disease. In addition, dental plaque that remains on teeth for several days hardens and turns into a substance called tartar, which must be scraped off your teeth. Tartar is what makes your teeth look yellow and smell bad, so you may find it difficult to get your mouth clean once tartar builds up on your teeth. Plaque forms as a result of chemical reactions that take place in your mouth. In order to create plaque, your mouth needs bacteria, carbohydrates, food particles, and saliva. Carbohydrates are found in most foods – even healthy fare like fruits and vegetables. Foods with a higher sugar content have more carbohydrates in them, so if you eat a lot of candy and cookies you are more likely to form plaque. The first step of plaque formation occurs when you break down food into carbohydrates while chewing it. The carbohydrates then combine with the natural bacteria in your mouth to create an acid. This acid by itself is problematic because it can eat away at enamel. But when the acid combines with left-behind particles of food and saliva, another chemical reaction occurs and the substance becomes sticky and somewhat hard. This new substance formed is plaque, and it sticks to your teeth, causing all sorts of problems if not removed. You can prevent plaque from forming in two ways. First, you need to pay attention to your diet. Since plaque needs carbohydrates to form, the fewer you eat, the better. Avoid candy, cookies, and other sweet things as much as possible in order to prevent plaque build-up. It’s not reasonable to avoid all carbohydrates, however. Many healthy foods still contain carbohydrates such as bread, cereal, potatoes, and corn. Thus, some plaque is going to form when you eat. In order to resolve this problem, the best thing you can do is brush and floss twice a day. Brushing removes plaque that has built up on your teeth. In addition, it removes loose food particles that contribute to the development of plaque. Brush your teeth going in two directions so that you brush off all plaque that forms on them and make sure you brush both the front and the back of your teeth. If you have a hard time brushing, consider using an electric toothbrush, which can automatically go in two directions. Additionally, you need to floss in order to remove food particles and debris from between your teeth. By flossing, you give bacteria less of a chance to form plaque. Once plaque gets onto your teeth, you have a limited amount of time to remove it before it hardens. Most plaque hardens within 48 hours of formation, and within several days it will become so hard that it is almost impossible to remove. This hard substance is tartar and the only way to remove it is to see your dentist for a professional scraping of your teeth. There are some toothpastes that promise to help with tartar control, but these toothpastes work by removing plaque off your teeth before it hardens and becomes tartar. Brushing your teeth is important for removing plaque that has already begun building up, as well as for preventing plaque build up in the first place. If plaque has formed on your teeth, but has not yet hardened into tartar, brushing can knock it off your teeth altogether. More than 80 percent of Indian adults suffer from periodontal disease caused by plaque formation. 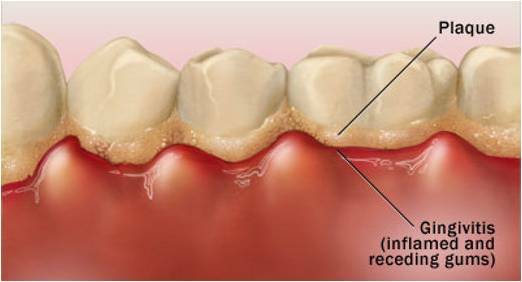 Plaque build-up can lead to tooth loss if left untreated. Plaque hardens within a few hours of forming on your teeth. Green tea and red wine help prevent plaque build-up. However, red wine can stain your teeth. Drinking cranberry juice can reduce plaque formation by up to 50 percent. Olive oil can cover teeth with a fatty film that stops plaque from forming on the teeth. People who drink green tea are 20 percent less likely to lose teeth due to plaque formation. Pregnant women are often more susceptible to plaque buildup and tooth decay than the general population. Although plaque build up can lead to gum inflammation, some people can suffer from gum disease without displaying any symptoms of it. It takes about 12 days for plaque to form into tartar. Thinking about dental plaque isn’t pleasant. But if left untreated, plaque can cause serious problems such as tooth decay and gum disease. Knowing more about plaque should encourage you to brush and floss so that you don’t have these dental hygiene problems. Talk to your dentist about additional ways to prevent plaque formation and keep your mouth healthy.